Covered glass cooking pot is a staple in the kitchen. When cooking on the stove top, we prefer using glass cookware such as this Visions cookware by Corning. The only exception to this is when we need a large capacity pot for making soups. 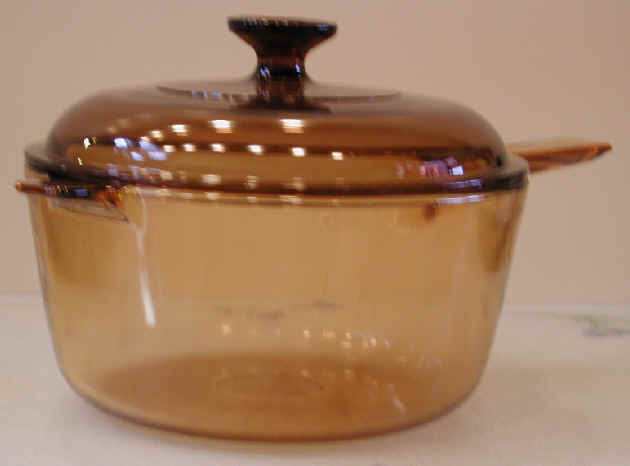 We have several sizes of these covered glass cooking pots. The larger one, pictured here, is great for cooking beans and rice. It is important to remember that it is best to bring the liquid to a boil, and then lower the heat to “simmer” or “low” to prevent sticking. Unfortunately, Corning ceased making this pot in 2001. If you’re interested in seeing if they have any left in stock in their stores, try calling 1-888-246-2737.